I do not have many regrets when it comes to the writing of either Weird Al: The Book or The Weird Accordion to Al, though I am more than a little ashamed that for the first fifty or so entries in this series I apparently referred to the subject of the column as “Wacky John” Yankelsnatch. That was really unprofessional of me. You’d figure that after writing a book about a guy you would at least know how to spell his name, but I sometimes make appalling errors over and over again that fill me with shame. I also regret that over the course of my research for Weird Al: The Book I never spoke with Al’s mentor Dr. Demento. 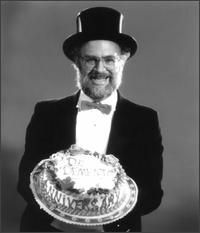 It is difficult to overstate the importance of Dr. Demento in Al’s life and career. The good doctor didn’t just give the talented young accordionist a sandbox to play in and a safe, supportive home to refine his gifts; he gave Al a new way of looking at the world, one that was kind and inclusive and lovingly embraced geekiness and eccentricity instead of shunning it. Early in his life as an artist, Al found an essential clubhouse where being uncool was cool, where the inmates ran the asylum, where being weird and demented was celebrated. Al is famously a creature of television, the subject of many of his essential early songs, but he was raised on the radio, specifically the Dr. Demento Show. Before Al was able to make the epic, game-changing leap from watching television and singing about television to actually being on television constantly, the clown prince of early MTV, he made a similar leap with radio. Al went from rapaciously consuming the zany ditties of the Funny Five to being the countdown king. Al and the Doctor enjoy a wonderfully symbiotic relationship: Dr. Demento helped make Al a star, a household name, a national treasure, an unlikely hit-maker. In return Al has done more to raise Dr. Demento’s national profile than anyone else. The non-demented world knows Dr. Demento primarily, if not exclusively, as the magical man who gave the world “Weird Al” Yankovic. Of course Demento done much more than that, but even if Demento did nothing more than that, his legacy would nevertheless be considerable. By the time Al and Jon “Bermuda” Schwartz recorded the eleven second Dr. Demento Show Show jingle included on Medium Rarities in 1981, his association with the Good Doctor was already long and fruitful. No long after making a quiet debut on Capitol with the “My Bologna” single in late 1979, Al repaid Dr. Demento for making his career happen by recording an eleven second jingle for his radio show that Demento still uses to this day. There isn’t a whole lot to the quickly and cheaply recorded little audio nugget, just Demento’s name chanted enthusiastically three times, a spare, martial beat courtesy of Schwartz and some demented cackling in keeping with the radio institution’s madhouse vibe. In keeping with the aesthetic of the show it’s promoting, the jingle has an endearing homemade quality that comes from being recorded cheaply and quickly on primitive yet effective technology. It did not matter to Dr. Demento or his listeners that Al was raw and unpolished, all potential and geeky intensity because he was simultaneously one of them and the ultimate outlier, the demented music icon who, through talent, hard work and preternatural canny and calculation, would break into the mainstream and MTV and movies and the Top 40 charts and have a career for the ages. Even someone with as much faith in Al and his extraordinary abilities as Demento could not have imagined just how far Al’s talent, self-discipline and hard work would take him. Demento obviously knew Al had something special or he wouldn’t have lovingly nurtured and mentored him when he was just a scarily smart kid with an accordion, but he could not have foreseen just how special and unique Al would ultimately prove to be.